I'm a huge fan of Philosophy...the packaging, scents and the fact that the products actually work..however at nearly £20 a pop for a shower gel..its a bit steep!! Now i don't know how long treacle moon products have been at tescos but i only stumbled across them last month...all i can say is how naughty...they are almost identical to philosophy!! Now naughty is always nice.....the price.....v cheap! The product range only has a few scents but wow they smell lush! If your a fan of coconut you'll love that one..super sweet! 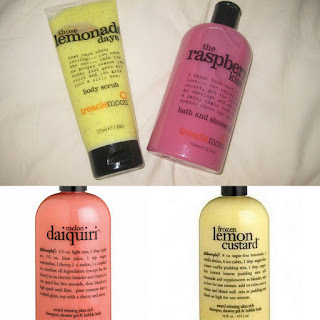 So i picked up the raspberry kiss shower gel and lemonade days scrub....I have used both and they smell great and leave a scent on your skin! All i can say is I'm converted..although i will miss my favourites..melon daiquiri and frozen lemon custard i just cannot justify spending sooooooo much when these little gems are soooo cheap!! Have any of you guys tried treacle moon products? Ooo they sound great! How much are they? I haven't tried these ones but I do love the Philosophy ones!